Welcome to Baker Insurance Services, Insuring Pest Control Companies Since 1999! Our contact information is provided below. If you are interested in insurance coverage for your pest control company, please do not hesitate to call us or use our online form below to request pest control insurance coverage. If you have any questions contact us at (662) 327-8812. 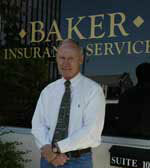 Baker Insurance Services began in Columbus, Mississippi in 1999. We currently insure over 900 pest control companies, primarily in the Southeast. © 2016 Baker Insurance Services. All Rights Reserved. Developed by Sociallyin.